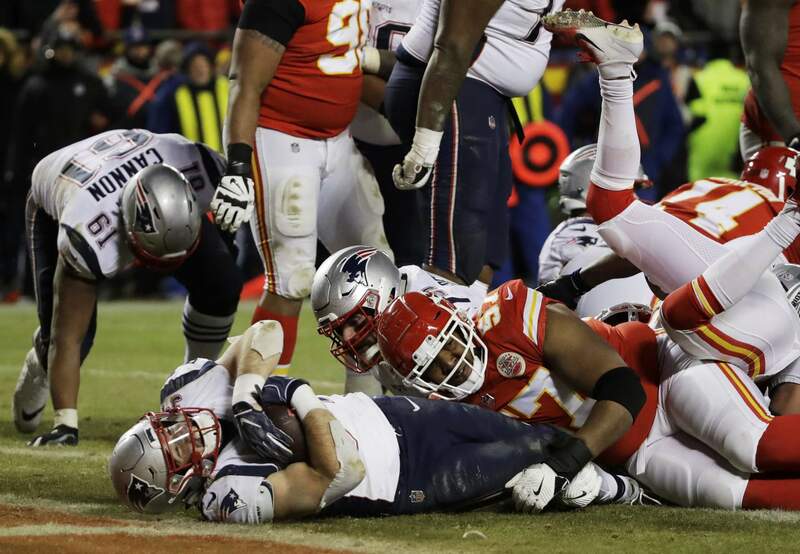 New England Patriots running back Rex Burkhead dives to the end zone for the game-winning touchdown in the AFC Championship game against the Kansas City Chiefs in overtime on Sunday in Kansas City, Mo. 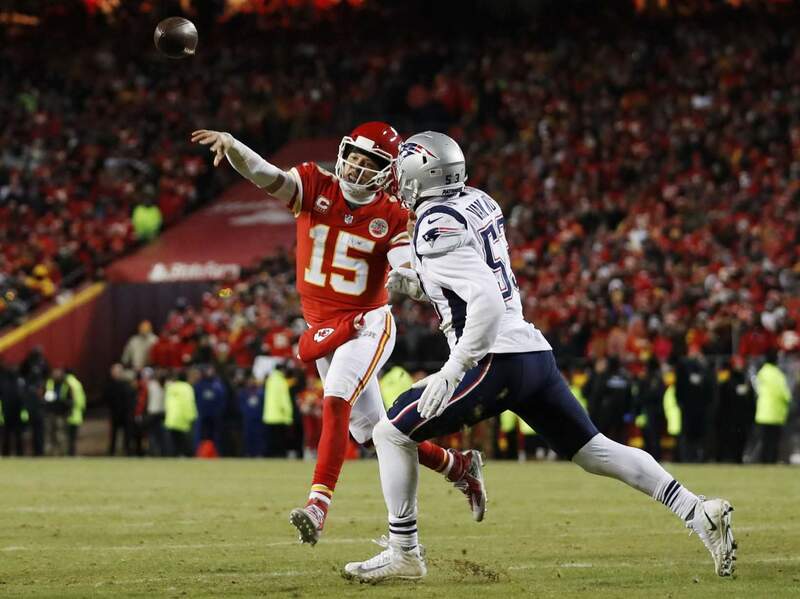 Kansas City Chiefs quarterback Patrick Mahomes throws a touchdown pass to running back Damien Williams against New England Patriots middle linebacker Kyle Van Noy during the second half of the AFC Championship game on Sunday in Kansas City, Mo. 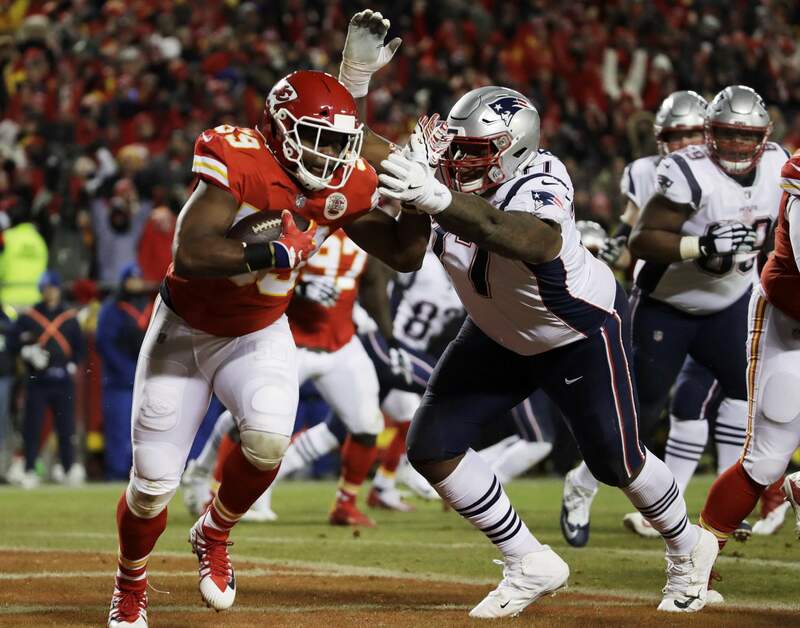 Kansas City Chiefs inside linebacker Reggie Ragland runs against New England Patriots offensive tackle Trent Brown after intercepting a pass during the first half of the AFC Championship game on Sunday in Kansas City, Mo. 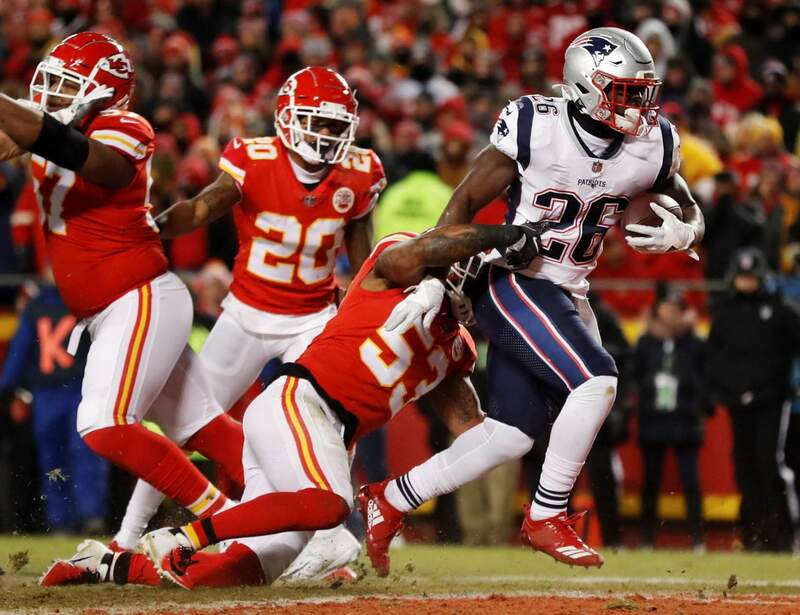 New England Patriots running back Sony Michel runs to the end zone for a touchdown during the first half of the AFC Championship game against the Kansas City Chiefs on Sunday in Kansas City, Mo. It took them overtime and more of Tom Brady’s brilliance to get there – for the third consecutive year. 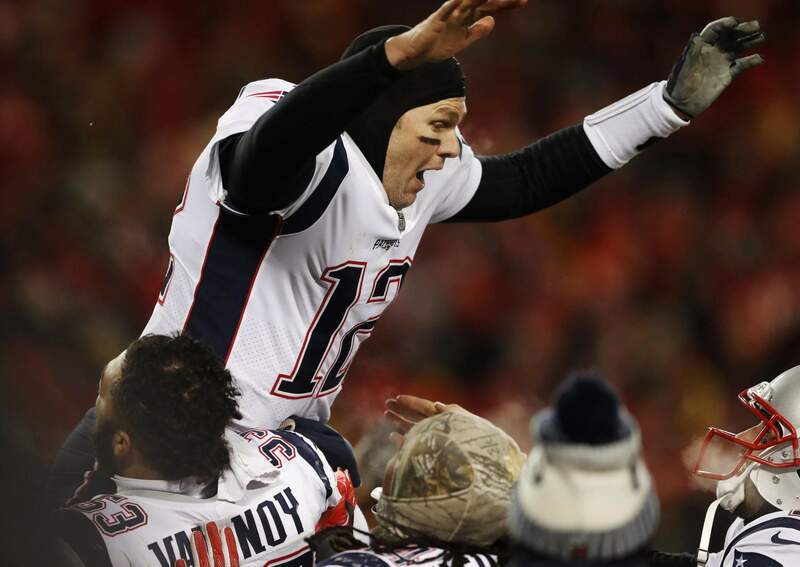 While the folks back home dealt with a frigid storm, Brady blew through Kansas City’s exhausted defense on a 75-yard drive to Rex Burkhead’s 2-yard touchdown run in a 37-31 victory Sunday for the AFC championship. Brady, at 41 already the oldest quarterback to have played in a Super Bowl, drove New England 65 yards in 1:24 to Burkhead’s go-ahead 4-yard touchdown with 39 seconds left in regulation. That was enough, though, for his far younger counterpart, the 23-year-old All-Pro Patrick Mahomes, to take the Chiefs 48 yards to Harrison Butker’s 39-yard field goal with 8 seconds left to force overtime. Mahomes finished 16-of-31 for 295 yards and three touchdowns. LOPSIDED FIRST HALFJust as they did last week in manhandling the Chargers early and cruising, the Patriots delivered a message – and a touchdown – on their first series. It was a classic, covering 80 yards in 15 plays and using up more than eight minutes. Michel, who had 113 yards rushing, scored from the 1. But Brady made a rare mistakes on the next dominant drive. His third-down pass from the 1 for Rob Gronkowski was short and Reggie Ragland picked it off. STATSIn Week 6, the Patriots beat the Chiefs 43-40 in a game featuring 946 yards total offense. This one had 814. ... New England has played in eight consecutive AFC title games, but this is its first road playoff win since the 2006 season vs. San Diego. ... Brady match former Patriots K Adam Vinatieri, now with the Colts, for most wins in NFL history (236). ... Kansas City’s defense tied for first in the NFL with 52 sacks, but had none on Sunday. New England had four. COIN TOSSReid’s decision to defer after winning the opening coin toss proved unwise as New England had 22 plays in the opening period, and Kansas City had seven. Then, the Chiefs lost the more important toss before overtime. Less than five minutes later, they were headed to the offseason. UP NEXTThe Patriots head to Atlanta to play the Rams in the Super Bowl.